"Linz", 38 in D, K.504 - "Prague"
40 in g, K.550, 41 in C, K.551 - "Jupiter"
The andante of the G minor is among the finest I have heard. Based almost entirely on repeated notes, this movement, even without repeats (as here) can all too often seem an almighty long slog. Tate firstly avoids making the repeated notes too detached, so there is the sense of a musical line, and secondly allows us to perceive when the repeated notes are leading forward to a climax, when they are winding down from one, and when they are marking time as an accompanying figure. In this last case Tate reduces them to a barely perceptible pulsation. The Menuetto also achieves a fine forward impulse at a steady pace and the finale is among the few to make a success of a slowish speed. With the string semi-quavers really enunciated and a beautifully phrased second group the music is given a range of expression we do not often hear. If I have left the first movement till last it is because, though possessed of similar virtues, again at a steady tempo, I did feel it could have done with a little more bite at times. Still, this is an important version of the symphony. I shall be less detailed with the others, because they differ less from what we normally hear. Basically you will find interpretations which are broad but energetic, beautifully phrased without any trace of mannerism, and above all structural integrity. I felt that the Prague was a little less inspired than the rest, with a first movement that sometimes lacks rhythmic momentum (the tempo doesn't slacken but certain lyrical moments are so lacking in accentuation that the music seems becalmed) and an andante which is spelled out rather didactically, as could sometimes happen with the great Otto Klemperer. For it is of Klemperer that these majestic interpretations remind us more than any other. The downsides of the Tate approach? Well, don't come to him for charm or grace. And, while it is clear that he feels the music with great intensity, you won't find the warmth and humanity of a Bruno Walter either. If you want to hear the Jupiter conducted as though every theme represents a different operatic character, listen to Eugen Jochum. Also, this is big band Mozart even though the orchestra is the ECO (but the textures never become thick), so those who have come to love period instruments in this music may not like it much. Tate's firm grip on the proceedings means that individual instruments are not invited to savour the timbre of their particular instruments during solo passages, everything is conducted and this, as in certain Leinsdorf performances, can lead to a slightly monochrome effect. 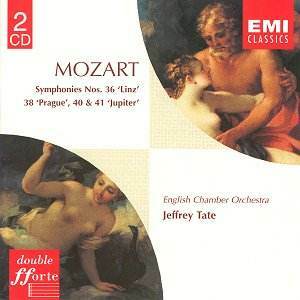 But those who stay away do so at their cost for Tate has something very special to say about Mozart, above all in the G minor. The recording is suitable, for it takes a slightly distant, mid-hall view rather than honing in on individual instruments. The anonymous liner notes, in three languages, are brief and would have been to the point had the G minor been conducted in a more orthodox manner.